As education continues throughout the life, it is very important to update and discover the innovative changes that happen in the world. Books and magazines play a vital role in molding the character of a person. Among the hundreds of educational journals, 'Education Insider' stands different for its novel approach in delivering information for the reading community who think about prospective in life. 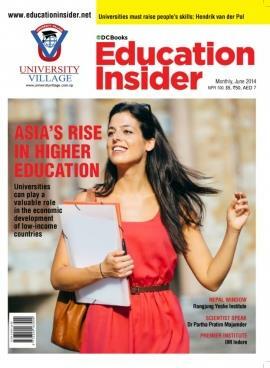 Education Insider magazine published by DC Media, the media division of DC Books is an emerging publication which comprehensively covers on Education with an innovative approach. The highlight of this magazine is the plausible, reliable and detailed news and views on education. As special focus is give to education in Asian countries, it is much useful for the students who wish to pursue their career in these nations. Articles on Innovative and strategic breakthroughs, emerging trends, research reports and analyses are insightful articles. Special interviews with experts, institution profiles, course details, education news and branding techniques would add life to the interest of readers. Being an exceptional magazine, 'Education Insider', is highly valued among students, top-level professionals, parents and edupreneurs. 'Education Insider is for corporates, policy-makers and the international community who wish to bring out their best while in performance. Giving out unbiased and independent views, this magazine brings together students, institutions, entrepreneurs and experts into a common platform. Highly influential articles on various topics including Civil Service, Career and Courses, Management Education, Fresh Beats and Study Destinations really stimulate the readers. Interesting interviews with reputed personalities and exam winners are useful bits for the young generation who wish to fly high with their career. Insightful articles complied by talented writers can keep the readers intact. Rich in content, 'Education Insider' can make one think more and prepare to achieve life goals. The magazine which comes with an affordable price tag can cater the needs of the young thinking community.